Progressing a claim through its lifecycle is labor intensive and causes delayed reimbursements. Automate workflows so that claims are routed properly and billing lag is kept to a minimum. 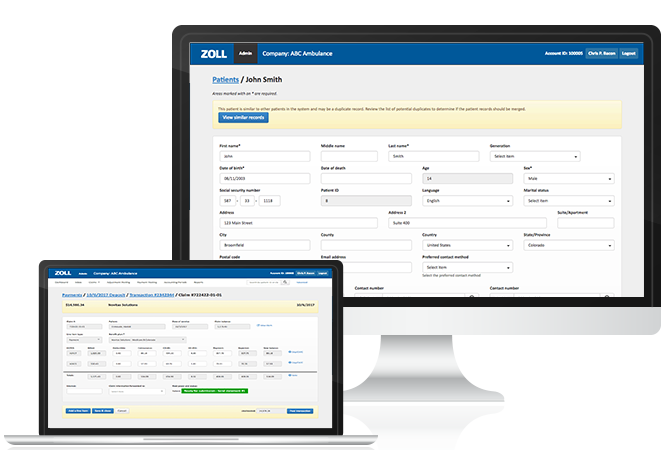 ZOLL Billing creates logical workflows that make it easy to use and allow billers to get accurate claims out faster. How Does ZOLL Billing Work? Cloud-Based – Eliminate IT overhead expenses. Expected Payments – Quickly see what you’re likely to get paid for each claim. Built in Medicare Fee Schedule – When Medicare changes its fee schedule, updates are automatically included in ZOLL Billing. Your team no longer has to hand code each fee, which eliminates hours of tedious work for your team. Check eligibility – Run patient eligibility to verify that the patient has active coverage on the claim’s date of service. Linked Payor Fee Schedule – Any payor account that’s linked to the Medicare fee schedule is automatically updated as changes occur, keeping your billing process efficient and accurate. Light Touch Billing – Automation is built into the system to keep claims in motion with fewer keystrokes, and less memorization and manual handling. Transport types supported – ALS/BLS emergency and non-Emergency including specialty care. Our cloud-based EMS billing solution allows you to quickly identify what claims are worth processing so you can optimize collections per claim, saving you time and money. In addition, the automated workflows enable you to process more claims per biller. Break down charges and payments by accounting period in real-time reports. Our payment prediction calculator helps forecast expected payment as charges are added and Explanation of Benefits (EOB) are delivered. Receive up-to-date changes to Medicare regions, Medicare Administrator Contractor (MAC) coverage and fee schedules. Check out our cloud-based ePCR solution.